Join me as I search and write about the good life. Fall is coming and it brings the inevitable cooler nights. 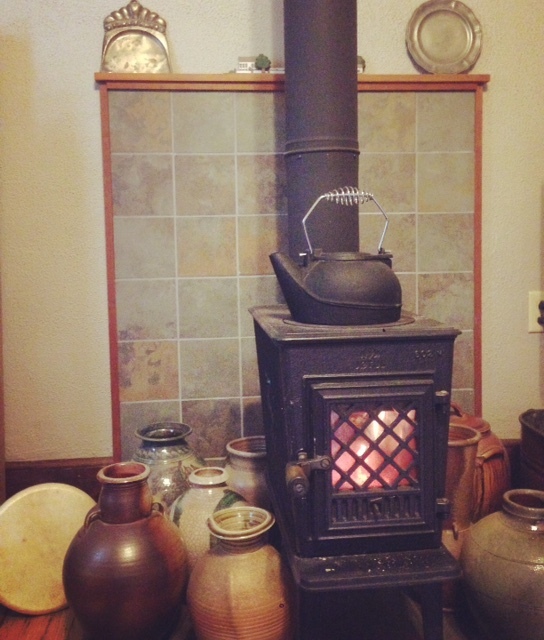 So far, we have only made one fire in our wood stove but we know that in the middle of winter, the stove will be giving us its all. Over many years (I want to say at least thirty), we have had a source of firewood fairly close at hand, if we are willing to drive out to get it. Jim has also been getting “real” wood there for multiple building projects and for his instrument making business. Started by a father and now run by his sons, this small mill work shop out in the country seems to stay busy throughout the seasons. So, last week, the car drove over the familiar route one more time and we were hoping to fill one more barrel full of scrap wood to bring home. The drive at this time of year is beautiful. We pass work horses and buggy horses out in the fields, the soybeans and corn are taking on color and a few pumpkins and mums are showing up by farmhouse porches. We are feeling wistful, though, as we near our destination because we know that LeRoy, father and owner, passed away only a month or so ago. I was taken aback when I saw his obituary in The Goshen News. As we ride, we talk about our visits with him over the years. How he would surprise us with a joke or a hidden reference to one of my columns, and keep us on our toes. Lately, though LeRoy no longer “ran the show”, he often would peek around the door as we were loading firewood, and draw us into conversation. Once he announced his arrival by playing his Jew’s harp, and then later informed us he keeps it in his pocket to play when his friend shows up with his harmonica. And yet another time, he plucked one of Jim’s mandolins, made with some of the wood from his shop. And then, there was the gum tree across the road that we often took pictures of and that he talked about it. As we arrive, we run into his son John and give our condolences. We listen to the story of his final days, and the crowds that gathered to say their final goodbye, and soon, as another son and grandson gather, we all have stories to tell, rich memories, and we laugh and talk. Though LeRoy is no longer physically in the room, he is somehow there in spirit, living through his sons and grandson. It’s a holy moment and I am honoured to be part of it. Later, as we fill our barrel with wood, and load it in the car, we take one last look at the gum tree across the road. Despite another death, it still stands, keeping vigil. The sons will carry on and the memories will stay for a long time. And whenever we go pick up some firewood, we will give a nod to a life well lived. Get the newest blog post as I post it. Thank you for joining this community!